The stock tools-in-trade of the well-dressed Air Traffic Controller in the 1940s were the Aldis signalling lamp and the Very flare pistol (on desk). Most light aircraft in those days were not radio equipped - and radio did not even make an appearance in Control Towers until the war years. It is thought that the photo above was taken in the Tower at Sydney/Mascot in the late 1940s. The Controller is not identified. 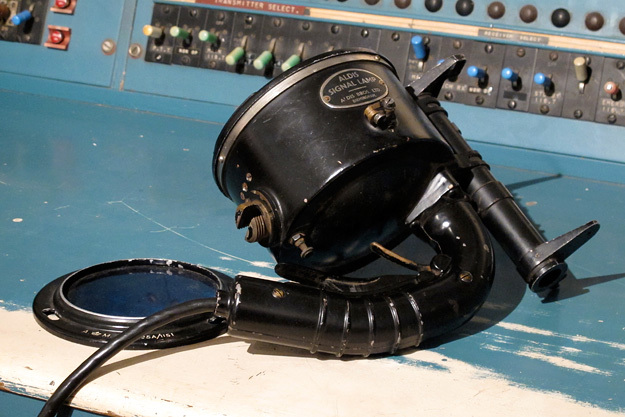 The photo below shows a working Aldis Lamp in the Airways Museum collection. it was manufactured by Aldis Bros. of Birmingham, UK, for the RAAF before being acquired by DCA. On the desk beside the lamp is a green lens. Red or green lenses, or no lens, could be attached to the front of the lamp as required. The lamp is operated by two triggers: the first, large, trigger illuminates the lamp; the second, smaller, trigger operates a reflector inside the lamp that raises the light beam. The method of operation is to aim at the aircraft using the sight on top of the unit. The lamp beam is then illuminated using the main trigger. The controller then uses the second trigger to operate the reflector to bring the light beam into alignment with the sight, and thus the pilot's eyes. Since these lamps were originally used to signal in Morse code, this arrangement allowed the lamp to remain continuously illuminated, with the apparent 'flashing' being a result of the use of the reflector to raise and lower the light beam in and out of the pilot's line of sight. This resulted in an enormously longer lamp life. Although the signalling lamp is still a feature of all Control Towers today for use in cases of radio failure, the flare pistol has sadly gone the way of the dodo.